General George Wade lived from 1673 to 14 March 1748. He was British military commander born in Ireland who was Commander-in-Chief, North Britain, from 1724 to 1740 and whose name is forever attached to the network of military roads he built across the Highlands. The wider picture in Scotland at the time is set out in our Historical Timeline. May by thy mighty aid Victory bring. This verse achieved great popularity in London theatres during the Jacobite uprising of 1745, when the National Anthem was first performed. It has since, together with a number of other verses that are less than politically correct to modern eyes, disappeared from sight. So who was "Marshal Wade"? George Wade born in 1673, the son of Jerome Wade, a dragoon officer who had been granted land in Ireland at Kilavally, Westmeath. He joined the British Army in 1690 and was promoted to Captain after service in Flanders in 1692. During the War of Spanish Succession, which lasted from 1702 to 1713, he rose rapidly through the ranks becoming a Brigadier General in 1708 and a Major General in 1710. On his return to London, Wade was appointed commander of the Army in England. During the 1715 Jacobite uprising he helped counter several plots in England, and at one point even arrested the Swedish ambassador in London. In 1722 Wade became MP for Bath. In July 1724, George I sent General Wade to Scotland. 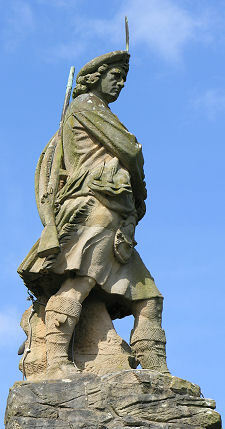 In the uncertainty following the 1689, 1715 and 1719 Jacobite uprisings, he was asked to "inspect the present situation of the Highlanders" and to "make strict inquiry into the last law for disarming the Highlanders". He reported that most Highlanders able to bear arms were ready to do so against the Crown. He recommended the construction of barracks, bridges and roads to help control the Highlands. George I immediately appointed Wade Chief of His Majesty's forces, castles, forts and barracks in North Britain, with the remit to put his own recommendations into practice. 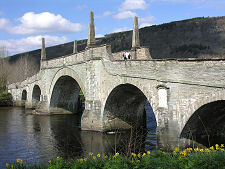 Between 1725 and 1737 Wade oversaw the construction of some 250 miles of road, plus 40 bridges, including his most striking legacy, the Tay Bridge at Aberfeldy. This was also known as "General Wade's Bridge" and cost of over £4000. Roads linking Perth, Inverness, Stirling, Fort William and Fort Augustus rapidly appeared where previously there had only been tracks suitable for single file passage of men or horses. 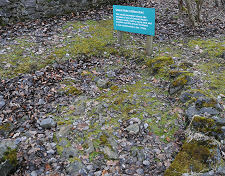 Part of his original road surface can still be seen at Killiecrankie. 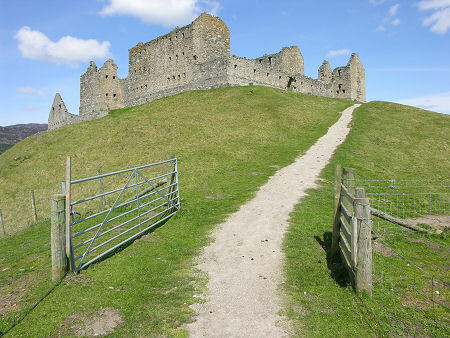 A key focal point for Wade's network was Ruthven Barracks, which had been completed near Kingussie in 1721. Wade was also responsible for raising a militia called the Highland Watches. The first six companies were formed in 1725, with another four in 1739. These became the Black Watch Regiment and marked the start of the widespread use of Highland troops in the British Army that persists right up to today. Meanwhile Wade conducted a largely successful campaign of diplomacy, that often entailed personally visiting Clan Chiefs whose loyalty to the King was suspect, and helping drink them out of claret. In 1740 Wade left the Highlands, leaving Major William Caulfield to continue building military roads. Wade was made a Privy Councillor in 1742, and in 1743 was promoted to Field Marshal, taking joint command of the Anglo-Austrian force in Flanders against the French. In 1744 he returned to England to become Army Commander-in-Chief. When Bonnie Prince Charlie's Jacobites marched south into England in 1745, Wade misjudged their intentions, allowing his forces to be bypassed and leaving London almost undefended. By now aged 72, he stood aside to let Prince William Augustus, Duke of Cumberland, take command of the army that pursued the Jacobites to their eventual demise at the Battle of Culloden. Wade died in 1748, aged 75. In his will he left the huge sum of £100,000 from his many investments, including part ownership of the lead mines at Strontian. £500 of this was set aside for the erection of a monument to his own memory in Westminster Abbey, where he was buried.